Consider this another friendly reminder from one camper to another to have a plan in place should severe weather strike while camping. Yesterday an EF-1 tornado hit the southwest side of Indianapolis and was on the ground for approximately 2 miles. As some of you may know, I reside on the west side of Indianapolis and had a helpless feeling as I was able to watch from the 5th floor of my downtown Indianapolis office as the storm tracked to the northeast. I felt a little more than helpless as I read tweets of the tornado being “a mile wide” and “on the ground in Speedway”, which is the town I live in. Fortunately those reports were false, as the tornado had lifted prior to reaching the Town of Speedway. 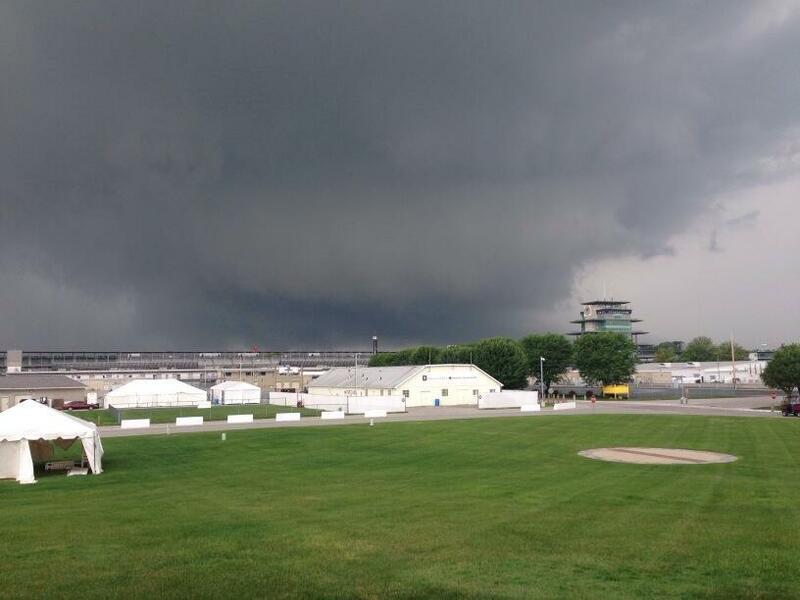 However, this photo taken from an employee at the Indianapolis Motor Speedway shows the super cell the tornado had been in as it traveled to the west side of the famed oval. Fortunately no one was injured, but it still should raise awareness to all campers that they stand little chance of surviving when a tornado attacks while you’re in a camper, trailer, or motorhome. And even though when you haul out on a sunny Friday for a weekend of camping, powerful storms can quickly pop up out of nowhere. Always have a plan in place when camping, know where the nearest shelter is, and by all means have some sort of weather alerting device on hand. Here’s a little lighthearted video from Mount Comfort RV showing what to do and what not to do when severe weather strikes.